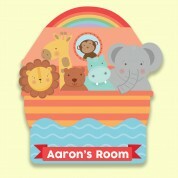 Our adorable Noah's ark plaque is a wonderful addition to any baby's nursery. 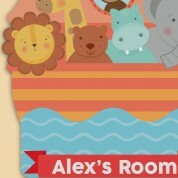 They will love to see the colourful design and learn all the animals names. Our specially designed and cut plaque features a big boat complete with a giraffe, elephant, hippo, bear, lion and cheeky monkey! They all bob along a wavy sea as a bright rainbow stretches over them. Our traditional plaque makes a special keepsake gift for a first birthday. Alternatively it would suit any religious event such as a Christening, Dedication, Confirmation or Baptism. 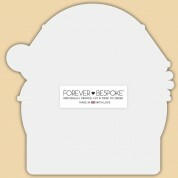 All of our personalised plaques are printed in the UK and bespoke for every customer. Our team of designers print each one individually, making every one a truly unique keepsake for the child.